When he was very young, Jip, so-called because he may have been the son of gypsies, fell from a wagon in a Vermont town, and no one ever came back for him. With nowhere else to go, Jip was placed on the poor farm, along with other marginalized residents, including the mentally ill and physically disabled. As one of the only able-bodied people at the farm, Jip has a lot of responsibility, including looking after Put, a "lunatic" who has occasional fits during which he becomes quite violent and unresponsive to those around him. When a stranger comes to the poor farm claiming to have knowledge of Jip's true identity, Jip is very suspicious, a feeling which is compounded by some of the stories given to him by his teacher at the school he starts attending simply to accompany another farm resident. When it becomes clear that Jip must run away to escape this stranger, he is torn between the desire for his own safety and his loyalty to Put. For a short novel, this book covers a lot of ground. 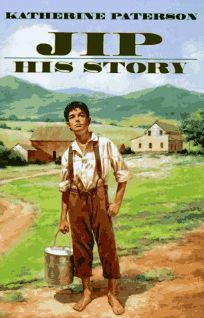 Through Jip's eyes, the reader learns about poor farms, the treatment of the disabled in the 19th century, education laws, schoolhouse culture, Oliver Twist, Quakers, Uncle Tom's Cabin, the slave trade, and the Underground Railroad. Paterson does quite a good job of keeping the reader very close to Jip's thoughts so that certain truths about his identity which might otherwise be obvious are hidden until the moment Jip realizes them himself. Because Jip is so isolated from regular society, he and the child reader are often learning things at the same time, which makes the explanation of new facts feel very natural and not at all didactic. The ending of the book is a bit strange. There is an epilogue of sorts that seems to raise some new questions and encourage interest in hearing more of Jip's story, but there is no sequel, so it feels like we're left hanging. There is, however, a blink-and-you'll-miss-it reference to another Paterson novel (Lyddie), which is a nice Easter egg for those who have read both books. It's a small moment, but it resonates strongly if you enjoyed Lyddie, and it's enough to make me want to recommend that people read Lyddie before Jip. I'm planning to read a dozen Katherine Paterson novels in 2019, and this was a strong one to start with. I really enjoyed her straightforward writing style in this book and the way each character comes to life in her economical but powerful descriptions. I recommend this book for ages 8 to 12.